It’s been more than 40 years since a used Toyota Corolla rolled off the lot for the first time. It’s perhaps one of the most recognizable vehicles on the road today, and has undoubtedly been the first car for thousands upon thousands of teenagers all over the world. Why? Simply because it’s a stellar mass-produced economy sedan. With a combination of high-quality design, low pricing, and being a frontrunner of Toyota’s history and motorization, the Corolla has had a successful life. Since 1966, Toyota has made sure to always implement new concepts and technologies into their Corolla models in order to give them an edge over the competition. Sometimes those concepts and technologies weren’t well-received, but were successful for the most part. Now in 2016, you can find a used Toyota Corolla for sale everywhere. From private sellers on Craigslist, to dealerships all over America. It was with the introduction of the 10th generation (2009-2013) that Toyota really took the Corolla to the next level. Before 2009, Toyota produced the Corolla for the Japanese market, then implemented technology that corresponded to the needs of each region. But, the focus for the 10th generation was to develop the Corolla from a global view point — not just with Japan as the focus. Therefore, this was the first generation that was truly the most global-friendly designed vehicle, meeting the needs of every region where it was released. For America, this was big news. Since one of the biggest focal points for automakers in the North American market is user friendliness, the Corolla was designed like that from the get-go. The Toyota Corolla is the best-selling vehicle of all-time, and that statement isn’t hyperbole. Having sold over 40 million units since it’s introduction in 1966, the sedan has become one of the most popular and beloved models in the entire world. There are a number of reasons why customers continue to return to this particular model. For instance, the vehicle is incredibly reliable, as many owners can expect to travel in the vehicle for more than a decade. The excellent fuel efficiency means these owners won’t have to invest extra money at the gas pump, while the affordable price tag saves them a considerable chunk of money right off the bat. Nowadays, there are a number of additional reasons why prospective buyers target the Toyota Corolla. The vehicle is equipped with a number of innovative technologies that can influence convenience, comfort, and entertainment. Meanwhile, the array of available safety features will play a significant role in keeping the vehicle and its occupants out of harm’s way. Clearly, there are a number of reasons why car buyers are so enticed by everything the Toyota Corolla has to offer. In 2009, close to 300,000 people bought a Corolla from either this year or from the previous generation. Everyone from teenagers to sixty-year-olds were getting their hands on this model for one reason and one reason only: reliability. At this point in time, the Corolla had built a reputation of being virtually bulletproof in every way possible. What does this mean for you? It means that there are still a lot of 2009 Corollas floating around on the market — especially from the 2009 model year. Compare that stellar reputation for reliability and the new global user-friendly approach that Toyota took with their Corolla for this 10th generation, and you have a winning combination for a used car. Apart from being larger on the inside and out, it also got a new 2.4-liter engine and navigation system for 2009. Don’t worry, fuel-efficiency is second to reliability for the Corolla’s popularity, so Toyota kept the 1.8-liter engine. But it was heavily revised for 2009, which gave it variable valve timing for both intake and exhaust valves. Even with the 200-pound weight increase, the power gains of the 2009 Corolla are very apparent on the road. The 1.8-liter four-cylinder engine is rated at 132 horsepower and 128 lb.-ft. of torque, paired to a five-speed manual transmission with FWD standard, or an optional four-speed automatic. With either transmission, you’re able to get up to 27 mpg city and 35 mpg highway. The all-new 2.4-liter engine is good for 158 horsepower and 162 lb.-ft. of torque. The same transmission setup applies, and even though fuel economy drops significantly to 22 mpg city and 20 mpg highway, those numbers aren’t abysmal by any means. Thanks to Toyota’s ergonomic approach for the Corolla in the 10th generation, cabin space is now a huge strong point. The control layout and seating are as ergonomic as possible, and storage is much more ample up front. Materials quality is high — like it always is — and the fit and finish is on-par with Toyota’s legendary commitment to high standards. Like every other vehicle that experiences a redesign to kick off the next generation, the Corolla model remains relatively unchanged for 2010. The only thing new is that stability control becomes standard. Otherwise, it’s virtually unchanged, with a few minor tweaks here and there. But, it’s still a better used pick than most other 2010 models out there. The engines are still competitive with the ones found in primary rivals for this year. For once, the base 1.8-liter engine is still able to fully satisfy consumers in terms of power and fuel economy. It’s also loaded down with plenty of entertainment features for the money. One minor tweak that was made is found on the inside of the cabin, where there is a tilt-and-telescoping steering wheel. This offers additional adjustment for long-legged drivers to get into a more comfortable seating position, which is something that was lacking on previous models. Therefore, if you are on the taller side, a used Corolla from 2010-2013 might be best. This is also the last year you’ll see the 2.4-liter engine. So if you want a Corolla with slightly more kick, grab it from either 2009 or 2010. For 2011, Toyota decided that an exterior refresh was in order. Trim levels have also been reduced from five to three, making buying options simpler. The XRS trim (with the 2.4-liter engine) has been removed, along with the XLE, which was the more luxury oriented trim level. For 2011, only the Base, LE, and S trim levels remain. While other economy sedans began to outpace the Corolla in terms of performance and fuel economy in 2011, this makes it an optimal vehicle to buy used. Why? Because the laws of depreciation dictate that if no one is buying a 2011 Corolla, the price will be lowered in an attempt to move these vehicles off the lot. Therefore, you could very easily find yourself buying a 2011 Toyota Corolla at a great used price. If you aren’t worried about saving every penny, then grab another model year. Standard power accessories for the base model and a new sound system for the higher trim levels are the two main additions for 2012. Audiophiles looking for an affordable used sedan will want to consider a 2012 Corolla. Alternatively, those who also like used Corollas but wish they had power accessories will want to buy from 2012. While the Corolla started to peter out on the new car market in 2011, the 2012 Corolla grabbed a seat in the same boat. While it got some revisions, courtesy of updated power accessories and a better sound system, other companies still began to outpace it. But, the 2012 model year is a goldmine (just like the 2011) for the same reason. The materials used in the cabin might not be as high-quality as the ones found on competing rivals from the same year, but that doesn’t mean they’re terrible. On the contrary, the seats in the Corolla feel like sitting in a recliner. Regardless of seating arrangements, there is still plenty of space for passengers. The 1.8-liter engine remains the sole engine choice, and it might not be getting as much as 40 mpg highway like competitors, but 27 mpg city and 34 mpg highway is still pretty good. Not to mention, you can find it for cheaper than the competition because many consumers don’t deem it as good as the other used sedans at this point in time. Again, for a super affordable option, 2011 and 2012 are both great choices. Toyota decided to make the last year of the 10th generation Corolla go out with a bang. Specifically, the brand added two new Special Edition versions of the LE and S trims. These boast unique color schemes and have added luxury features. No doubt making up for the loss of the XLE luxury-oriented trim back in 2011. For example, the LE Special Edition added on 16-inch alloy wheels, heated front seats, leather upholstery, a power driver seat, a navigation system with Entune, and a unique Black Currant Metallic exterior color. The Special Edition S trim gets most of the same features, but with a Hot Lava paint color and 17-inch alloy wheels instead. Both models also get Special Edition badging and floor mats. They’re still both powered by the same 1.8-liter engine, and achieve the same fuel economy and power ratings. If either of these special editions sound cool to you, then 2013 is the model year to target. Following generations upon generations of models, Toyota decided to completely revamp their Corolla for the 2014 model year (this happened to coincide with the introduction of the 11th generation of their iconic sedan). Perhaps the biggest change came to the vehicle’s accompanying engines, as the brand included the continuously variable transmission in this generation’s Corollas. This addition had a drastic impact on fuel efficiency, as drivers could expect an incredible 42 miles per gallon on the highway in the new LE Eco trim. Of course, there were also an assortment of cosmetic changes to the model. The addition of a larger frame gave the vehicle a wider stance, and it also influenced the power of the vehicle. Meanwhile, the longer front end positively impacted aerodynamics, which impacts performance and efficiency. While the new front grille did little to influence the vehicle’s capabilities, it undeniably added a bit of sportiness to the car. Drivers and passengers particularly appreciated the modifications inside the vehicle, as the larger frame led to an additional five inches of room for rear passengers. Furthermore, engineers added a number of optional, high-class amenities to their interior, so as a buyer, you could truly transform the standard sedan into a pseudo luxury car. The addition of a standard rearview camera helped to maximize occupant safety, as drivers could monitor everything that’s happening behind their Corolla, allowing them to avoid crashes. Finally, the keyless entry led to maximum convenience, while the keyless ignition made it incredibly easy to turn on the vehicle (while also managing to maximize security). 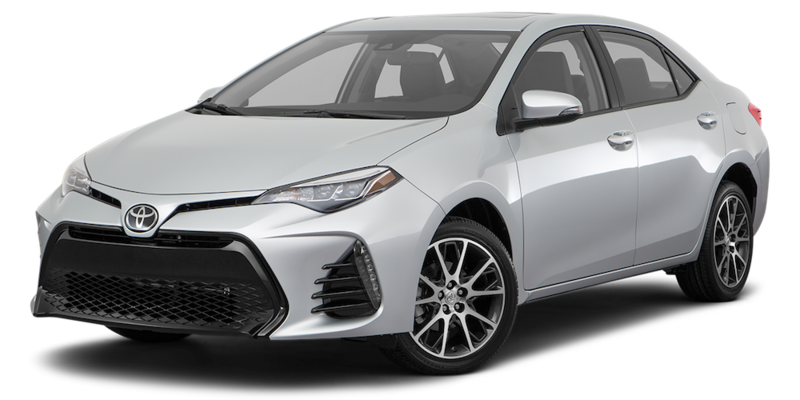 Having redesigned the vehicle only a year before, Toyota’s engineers kept their Corolla pretty much the same for the 2015 model year. This meant that many aspects of the vehicle remained, including the lone engine option. The 1.8-liter four-cylinder engine was still included under the hood, with the system capable of cranking out 132 horsepower (this increases to 140 if the driver opts for the Eco trim). Fortunately, customers did have their choice of transmissions, as they could opt for the six-speed manual system, the four-speed automatic, or the previously-mentioned continuously variable transmission. Just like 2015, Toyota decided to roll their redesigned Corolla over to the 2016 model year, meaning customers could expect few changes. Of course, this isn’t an issue, as the sedan is still a more-than-capable option for those seeking a well-versed car. One of the most appreciated aspects of the Corolla are the number of different available trim options, meaning buyers could customize their vehicle to their liking. The “L” offering is essentially the standard version of the sedan, with the main amenities centered around technology. The infotainment system is accompanied by a four-speaker sound system and Bluetooth connectivity, allowing drivers to easily connect their smartphone to the car. The LE builds off these amenities, providing drivers with comfort features like the automatic climate control, which allows each occupant to travel in their optimal temperature setting. This trim also included amenities like a touch-screen audio display and heated outside mirrors. The LE Plus added several amenities to the vehicle’s exterior, including striking 16-inch alloy wheels and new fog lights. The LE Premium trim predictably adds a number of “premium” materials to the interior, like leather upholstery and an easy-to-use moonroof. Finally, the LE Eco maximizes the vehicle’s efficiency, allowing the driver to save some money at the gas pump. The “S” trim is for those who are looking to add some sportiness to their car, as engineers included features like new paddle shifters and more effective fog lamps. The “S Plus CVT” adds those 17-inch alloy wheels and a real spoiler, while the “S Plus 6MT” includes the innovative Entune Premium Audio system and a leather-wrapped steering wheel. The “S Premium” sees many of the same additions as the “L” trim (albeit with a sportier design), while the “S Special Edition” includes opulent interior materials. It’s a bit of a stretch, but this particular year marked the 50th anniversary of the model’s debut in Japan, and to celebrate this milestone, the brand released their 50th Anniversary model. This specific version of the Toyota Corolla included amenities like 17-inch alloy wheels, the Entune infotainment system (with the accompanying seven-inch touchscreen), and a number of anniversary-centric features. Outside of this specific offering, engineers included a number of features to their standard version of the sedan. For instance, a list of useful safety features became standard, including the pre-collision braking system (with pedestrian detection), the appreciated adaptive cruise control, and a lane departure warning. The interior climate controls were slightly revised, as was the backup camera. Now that you’ve determined that a used Toyota Corolla is the proper choice, it’s time to start shopping. If you live in the Cincinnati, Ohio area, then there’s no better place to purchase that vehicle than McCluskey Chevrolet. The dealership provides a number of incentives for visiting their facility, and customers could be driving off the lot in their used Toyota Corolla in no time.